Why do Rainbow Sandals have a reputation for lasting so long? Aside from the colorful label and their classic design, Rainbow Sandals are designed for longevity through years of wear. Made from high-quality, customized materials, every rainbow sandal is constructed with durable layers. From the very beginning Rainbow founder Jay Longley wanted to make a long-lasting sandal that "would not end up in a landfill." Rainbow's philosophy starts in its soles; they're constructed in layers which allow them to be repaired where needed. The Rainbow Sandals founder customized and created almost every piece of the sandals' high-quality materials on his own. Starting with the sponge rubber density, each layer conforms to the wearer's foot over time. Even the strap's nylon webbing is made not to stretch. and the specially-formulated glue that holds each layer together. From start to finish, Rainbow Sandals' design means they will last for years to come. Also, Rainbow accepts worn Rainbow sandals for donation to be repaired and then re-donated to victims of natural disasters and homelessness through their Repair, Reuse, Recycle program. Recycling the sandals serves the double purpose of helping those in need and preventing repairable things from unnecessarily ending up in a landfill. 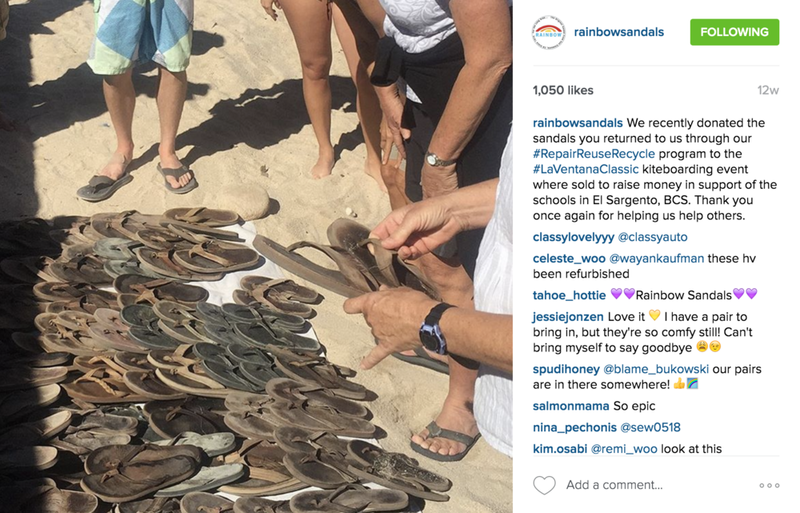 When your Rainbow Sandals are ready for retirement, take advantage of Rainbow's Repair, Reuse, Recycle program and mail your retired Rainbow Sandals with a note that includes the word "donation" and your name and address to: Rainbow Sandals, 9020 Calle Negocio, San Clemente, CA, 92673.